According to the circular, ten boy Scouts, ten girl Scouts, one male and one female leader were selected from different districts by NHQ. All participant scouts came to NHQ (National Headquarter), Kathmandu, on 8th February 2003. But the leaders were called on 4th February 2003 to make essential arrangements for the journey and camping. All the boy and girl scouts were very interested and excited about the journey and Camp. The team left NHQF Kathmandu on 10th February by a Minibus at 6.30 am according to the journey schedule. Good wishes from our Honourable chief Commissioner and International Commissioner and bunches of flowers and tika were offered to every member of the team by the National Secretary at the departure time. At 8.00 am we had our breakfast on the way. We had our lunch at 11.20 am in a café cottage Narayan gadh, Chitwan. It was very nice. At 2.30 pm we arrived at Bhairahawa, Sunauli. After refreshment and cold drinks we started our journey by rickshaw from Sunauli, Nepal to Sunauli, India. We got into a minibus at 4.40 pm and we arrived Gorakhpur India at 7.00 pm. We stayed at Siddharth Hotel. The (Rapti Sagar Express train 5222) departure time was 4.30 am on 11th February so we got to the Gorkhppur Railway Station at 4.00 am. But the train was four hours late. So it arrived at 8.00 am. All the members of the team were very curious and excited because it was a long journey and some of the members had not seen a train or railway station before. It was a long train journey. It took 72 hours. Lunch, dinner, breakfast, tea, coffee, cold drinks were available in the trains' dining car. So it became easy and comfortable for us. In Gorakhpur we had arranged sliced bread, butter, jam, biscuits, oranges, grapes and bananas for the train journey. It is very easy to get everything you need at the railway stations in India. Each participant was happy and enjoyed the journey. We sang and danced together and the three days went very well. The other passengers were also happy enjoyed themselves and used to come to us to join us and thanks us. We left the train in Thirubanthpuram at 5.00 am on 14th February. We went to Bharat Scouts and Guides State Headquarters, Kerala Thirubanthpuran. We freshened up and had our breakfast in a Hotel and went to the Airport at 8.00 am by taxi. Bajaj Travels had arranged our air tickets we all flew on the same flight from Thirubanthpuram to Male by Indian Airlines which left at 10.30 am. We landed at Male Airport at 11.45 am. After completing the essential formalities we came out of Male Airport. Five members of Protocols of Maldives Association were present there to receive us. After taking cold drinks we went to a ship and from there we sailed to Finolhu, Fildohu Island where the Camp was to held. We reached there at 1.00 pm. It was hot for us. We were divided into three groups. Girls were allocated a building hall; boys were allocated a tent and leaders in separate rooms. The Bhutan team was there. It was a tremendous, wonderful and exiting for the team members of a land-locked country. We were surprised to see the sights, ships, green and blue-coloured water. We all took showers and lunch at 2.30 pm on 14th February. Every member began to move around to see the marvelous sight of the Indian Ocean. Some talked with the Bhutanese Scouts. The Goodwill Ambassador from Nepal recognized them and they expressed their views and happiness. Some members moved around the shore and collected some corals and fossils. At 4 pm Mr. Abdullah Rasheed, the AP Regional Director, and his team from Manila came with the Camp Coordinator. They met us on the shore and suggested "Don't collect more, your luggage will be heavy." 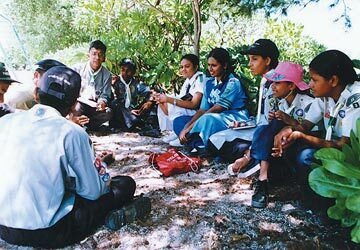 ‘Protection of the Environment’ was the theme of the second SAF Scout Friendship Camp, held on Feydhoo Finolhu island in the Maldives from 16th - 22nd February 2003. It was an amazing experience, especially for girls and boys coming from landlocked countries, such as Nepal and Bhutan, who had never seen the sea. In the evening, we talked with the Maldivian people and asked them questions about the Maldives. They were very friendly. We were tired so after dinner we went to bed at 10.30. On 15th February we enjoyed swimming in the ocean and moving around the island and shore, collecting corals talking to each other and watching the ships. Other contingents arrived on 16th February. Meeting and talking to each other was exciting and everyone was very happy. Everyone was making new friends, writing addresses and exchanging cards and other materials. They seemed to be all be from the same family. There was no tension, no enmity. A friendly environment was everywhere. In the evening, the welcome, reception and introduction started. It was a very nice technique. All the camp members were happy and excited. Singing and Dancing was a major part of this programme. A programme schedule of the camp was distributed to the leaders for 16th to 23rd February. The programme schedules were from morning to night. Everything was included in that schedule. The contingent leaders meetings used to held at 10 pm. We discussed everything at the meetings, including the next days' activities. The opening and closing ceremonies were good. The Education Minister was the chief guest and other ministers and other dignitaries were also present. The workshop was useful and input speeches from guest speakers were also beneficial. They supported the participants and the whole camp. It became easy to discuss the themes, to propose resolutions and fulfill the purpose of the Camp. The live music, water activities, night fishing, excursions to resorts and an inhabited island were all very exciting and appreciated as was a very interesting cultural exhibition. Above all, the presence of Honourable Mandanjeet Singh, the Ambassadors and High Commissioners enlightened and encouraged the Camp. The food, accommodation, light and water management were good but it was little bit difficult for the vegetarians. Transport and hospitality was good. 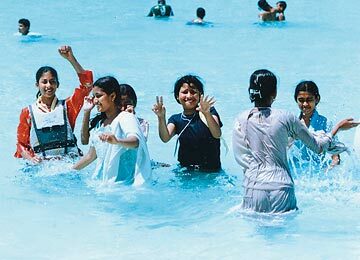 The Maldivian people are very friendly. We started our back return journey on 23rd February taking the same route and transport as when we had come. We got back safely and in good condition to NHQ Kathmandu, Nepal on 28th February 2003 at 7.30 pm. a) Media coverage should be extended. b) More use of the Contingent Leaders. c) Vests, bags and caps etc should be distributed to participants for publicity and effectiveness. d) Souvenir books and reports should be sent to the NGO and the Government and other (INGO, NGO) agencies. e) Age limit or some scout age and some Rover Ranger age. Thanks from the bottom of our hearts to UNESCO Goodwill Ambassador Respected Madanjeet Singh and the South Asia Foundation Chairpersons who brought this idea for the promotion of regional peace and cooperation through this type of event. We are grateful also to the Scout association of the Maldives, The Maldivian government and the people for hosting it in such a very friendly manner. His Excellency Ambassadors, High Commissioners and other dignitaries who helped and encouraged the camp. This camp should be continued. It will be useful and fruitful.